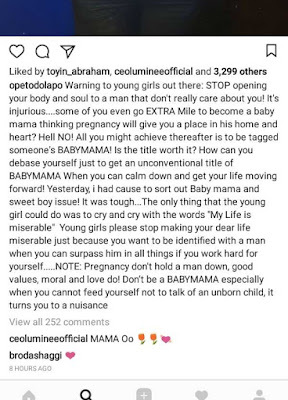 Police PRO Dolapo Badmus warns youths against becoming baby mamas! ”Warning to young girls out there: STOP opening your body and soul to a man that don’t really care about you! It’s injurious….some of you even go EXTRA Mile to become a baby mama thinking pregnancy will give you a place in his home and heart? Hell NO! All you might achieve thereafter is to be tagged someone’s BABYMAMA! Is the title worth it? How can you debase yourself just to get an unconventional title of BABYMAMA When you can calm down and get your life moving forward! Yesterday, i had cause to sort out Baby mama and sweet boy issue! It was tough…The only thing that the young girl could do was to cry and cry with the words “My Life is miserable” Young girls please stop making your dear life miserable just because you want to be identified with a man when you can surpass him in all things if you work hard for yourself…..
As shared by the very social media savvy Police Public Relations officer..